Marks JCH offers classes to help immigrants prepare for written and oral citizenship exams. Run with the help of the New York Legal Assistance Group and funded by DYCD, the program is open to immigrants of NDA 11 with any legal status who have lived in the U.S. for four years and nine months. We also provide assistance with citizenship application forms n-400, n-648 and others. Fees: None, other than cost of U.S. Citizenship and Immigration Services application fee. Schedule: Classes offered throughout the year, Sundays 9:00 am – 1:00 pm. 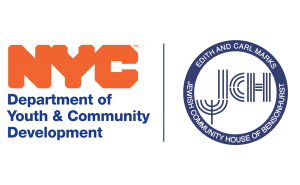 The mission of the Marks JCH of Bensonhurst, known as the JCH, is to be a center for community life in Brooklyn that is rooted in Jewish values and fosters an inclusive environment. We affect residents at every life stage by providing critical services that lift people out of poverty and innovative programs that educate and inspire. The JCHB.ORG Web Site is offered to you conditioned on your acceptance without modification of the terms, conditions, and notices contained herein. Your use of the JCHB.ORG Web Site constitutes your agreement to all such terms, conditions, and notices.